Narrator: In an urban society, everything connects. Each person's needs are fed by the skills of many others. Our lives are woven together in a fabric. But the connections that make society strong also make it vulnerable. On September 23, 1984, the BBC telecast the most horrific, the most gruesome, the most visceral viewing experience in mainstream television history. Almost twenty-five years later, no broadcast has even come close to making a similar impact. Perhaps more importantly, current world politics make this provocative and powerful anti-war statement as relevant as ever. 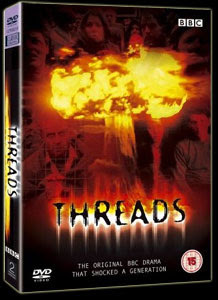 THREADS is a shocking examination of what would really happen if an all-out thermonuclear war were to take place. 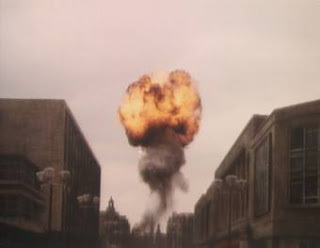 Set in Sheffield, England, Britain's fourth largest city and a prime military target thanks to a nearby NATO airbase, this apocalyptic political drama, shot in a terrifyingly realistic semi docu-drama style, proves once and for all that a widescale nuclear conflict is neither winable nor survivable. Forget about "duck and cover" -- those wooden school desks, much less all the duct tape and vinyl sheeting money can buy at Home Depot, will not save you or your family. The First Act introduces us to our primary characters, Ruth Beckett (brilliantly portrayed by Karen Meagher) and her boyfriend, Jimmy Kemp (Reece Dinsdale). When Ruth discovers she is pregnant they decide to get married, a decision that is not totally supported by their families. Although set in the Cold War, Writer/Director Mick Jackson suggests that the Soviet Union is interested in making Iran a Soviet satellite and so Russian troops are marched into that mid-east country triggering a tense stalemate with the United States and its allies. As tensions continue to mount, we see Ruth and Jimmy and their families continue their normal daily routines paying little attention to the increasingly escalating situation in Iran. After an exchange of tactical nuclear weapons within the borders of Iran an all-out thermonuclear war ensues and Sheffield is hit by two Russian ICBMs, annihilating most of the city and its inhabitants. 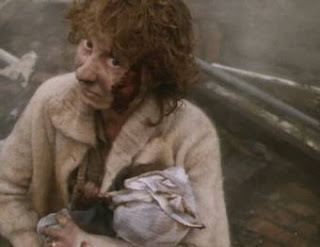 Jimmy is killed in the resulting firestorm, but Ruth and her family survive, their house severly damaged but not destroyed. And it is the dead who are the lucky ones. At one point prior to the attack a character in a pub states, "If an atomic bomb does drop, I wanna be pissed out of my mind and straight underneath it when it happens." The Third Act takes a look at the aftermath of some 3,000 megatons of nuclear destruction worldwide. Civilization, as we know it, no longer exists. All the threads are irreparably severed -- there is no water, no food, no electricity, no communication, and nothing resembling public order, only chaos, despair and suffering of unspeakable magnitude. 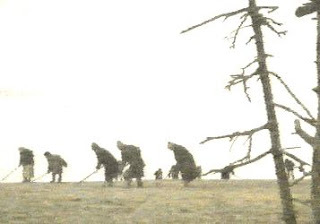 And, of course, there is the radiation sickness which slowly, painfully, chillingly takes the lives of Ruth's family and countless others, leaving a barren, radioactive, inhospitable landscape where crops are almost impossible to grow and daily life is reduced to, at best, medieval conditions. Ruth eventually gives birth to an apparently healthy daughter before she succumbs to leukemia thirteen years after the attack. As if this isn't depressing enough, the finale will leave an indelible impression as the very future of mankind is depicted in a brilliantly suggestive, off-camera manner that will haunt the viewer for the rest of his or her life. Make no mistake, you will be stunned virtually into submission, and the 401K problems you are worrying about today will seem ever so insignificant. 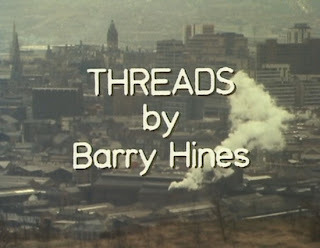 One final comment: A little less than a year before THREADS premiered in England, ABC broadcast THE DAY AFTER. This somewhat similar film starring Jason Robards, JoBeth Williams, Steve Guttenberg and John Lithgow examined post nuclear life in Lawrence, Kansas. I can still remember being frightened by this landmark program; if you saw it also, you, too, might recall the alarming effect it had on virtually all viewers. With this being said, let me state that in no uncertain terms THE DAY AFTER is like a picnic in the park when compared to THREADS. There have been a dozen or so excellent films exploring a post apocalyptic, post nuclear world. The same is true for films taking a strong, unrepentant anti-war position. THREADS is at the very top of this list -- it is a film you must see and a film you will never, ever forget. THREADS may be a difficult DVD to find, but the search is well worth it.